If you don't yet have the Big Shot machine, get it NOW! Why am I so adamant about telling you that you NEED to get your very own Big Shot now, before the of March? 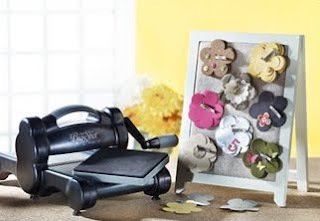 The Big Shot is a fabulous die-cutting machine by Sizzix that can handle not only their dies, but ones from other companies too. Stampin' Up! has exclusive dies, embossing folders and texturz plates that are not available elsewhere, and even the ultralarge ones fit in it perfectly. Stampin' Up! 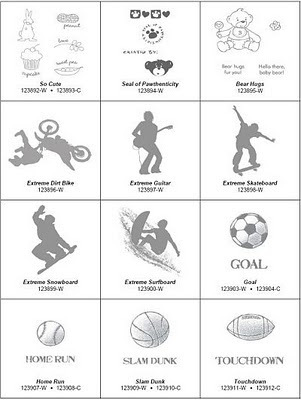 has also developed some great raw materials for you to use with your Big Shot machine. Currently, we're offering 19 colors of raw vinyl sheets and needed transfer sheets. You can also purchase raw chipboard sheets, adhesive sheets, cork, magnet sheets and wood sheets sized specifically for the Big Shot. We even have CHALKBOARD! Dies for the Big Shot aren't just for cards and paper projects...sewers & quilters will LOVE how easy it is to use! With the Big Shot you can cut over 50 different material types so that you can duplicate creative and intricate designs quickly and easily. Order it before March 31 and you get not one, but TWO Sale-A-Bration free products with it. Get FREE SHIPPING as well when you order it through me before the end of March 31! 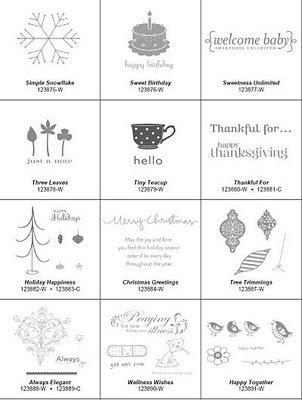 Have you been meaning to place your Stampin' Up! order to get the free Sale-A-Bration goodies but just plain forgot? Is it early menopause? Mommy brain? Multi-tasking gone wrong? Fuggedaboutit...it's not too late. You still have a few days to take advantage of SU's biggest sale of the year -- but JUST until Thursday March 31...and then the freebies wave "bye bye". Here's the recap on what's going on during SAB in 2011! This year we've got four great Sale-A-Bration sets for our hostesses and customers to choose from -- as well as a Designer Series Paper & Quick Accents pack, a Ribbon & Button pack, digital downloads, and Décor Elements! You definitely WANT to check out the Sale-A-Bration mini catalogue that shows all the choices you can pick from. 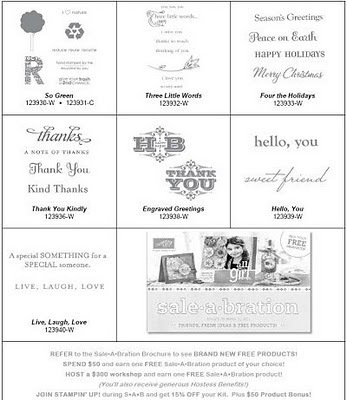 FREE WITH PURCHASE: You will receive a free Sale-A-Bration product for every $60 you spend (before taxes, etc)! HOST A FREE WORKSHOP/CLASS: A hostess will receive a free Sale-A-Bration product for every $395 in workshop sales*, in addition to our regular hostess benefits! *Note: This benefit is only available on qualifying customer, demonstrator, and workshop orders. 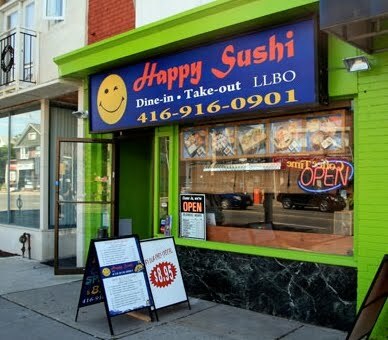 Online orders do not qualify. JOIN THE TEAM: New recruits will receive 15 percent off their Starter Kit (Standard or Digital+), plus a special Sale-A-Bration bonus bundle, valued up to $60! 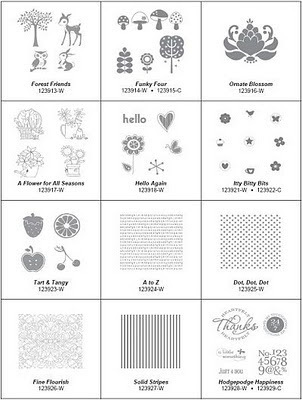 If you want more choices than these, you can also redeem your Sale-A-Bration rewards for any one wood-mount stamp set of $17.95 or lesser value or any one clear-mount stamp set of $14.95 or lesser value from the Idea Book & Catalogue. Doesn't THAT just give you tons of new opportunities for free stamps?!?!? Stampin' Up! Colours in HEX/RGB values! 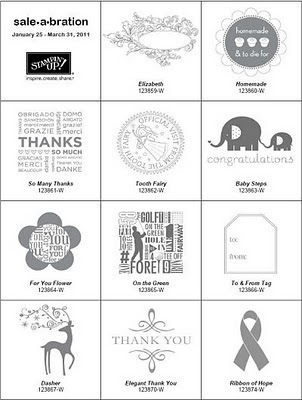 When printing your own titles or greetings for scrapbooks and cards, why stop at Basic Black? Listed here are the HEX (Web Colors), RGB (Red Green Blue), which are both normally used for the web and graphics, and CMYK (Cyan, Magenta, Yellow, Black - percentages normally used for printing) values for each of the 40 Exclusive Stampin' Up! Colors, In-Color and retired colours. If you find any of these colours aren't right, please let me know and I'll check them. Remember that screen colours and printer colours will vary slightly. If you aren't sure how to use these colours in your word processor or other software, Marni Levett has put together a tutorial that will help. Click for How to Use RGB Codes. Many thanks to Marni for kind permission of the sharing of these charts! Today hasn't been an easy one for our family, as we had to say goodbye to one of our beloved pets this morning. Ani Noelle was my baby. Brent picked her out for me as a birthday present 15 years ago when she was just a 6 week old bundle of long silky black fur. She was an odd cat, this one. She had the loudest purr imaginable and loved to be stroked, yet she was the biggest scaredy cat around and hid whenever people come over. She lived more or less out of Serena's closet for a good 10 years! I remember when our family went away on vacation and our friends came to take care of the cats for a week. Although I'd warned them that they likely wouldn't see her, they spent over an hour on that first night looking for her in all the nooks & crannies, under the beds, convinced she had disappeared into thin air! This morning, we had a chance to say our goodbyes before her cancer-ridden body was put to rest. She was stroked and petted until the very end, purring her love to us all the while. Go in peace, darling Ani.